The recent 2015 Monsters Of Rock cruise raised $48,000 for the Ronnie James Dio Stand Up And Shout Cancer Fund. The cruise – which featured more than 30 acts including Extreme, Black Star Riders, Tesla, Night Ranger and others – held daily activities to help raise funds for the charity named after the late rocker, who passed away from gastric cancer in 2010 at the age of 67. Activities included auctions, Rock 'N Roll Bingo and Dine and Donate for Dio. "I cannot thank Larry Morand, Mike London and the fantastic Monsters Of Rock Cruise Production Staff, as well as the very generous passengers, who dug deep into their pockets during our wonderful five days at sea," says Wendy Dio. "I want them all to know that every penny raised will go to cancer research so that one day we will find a cure for this terrible disease that takes so many of our loved one's lives. Ronnie would be so proud." 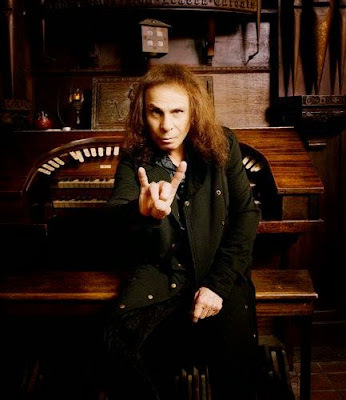 The Ronnie James Dio Stand Up and Shout Cancer Fund is dedicated to cancer prevention, research and education and is committed to raising money and awareness in hope of one day finding a cure for this disease. The charity is hosting a series of events in Los Angeles in May to mark the fifth anniversary of the singer’s passing. The May 15th - 17th weekend will include a public Memorial Service, a Bowl For Ronnie Celebrity Bowling tournament and the inaugural Ride For Ronnie motorcycle ride and BBQ.